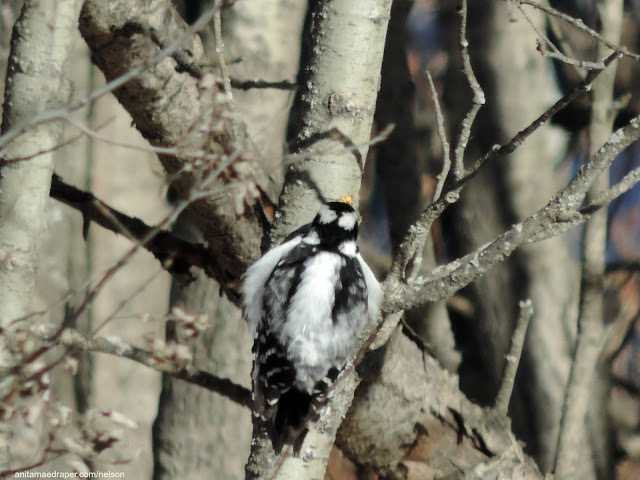 Nelson started off our February 2018 bird watching competition on the 1st by bringing home this shot of a Downy Woodpecker female. He said it caught his eye in flight and he was able to follow it to a small copse of trees where he took the photo. 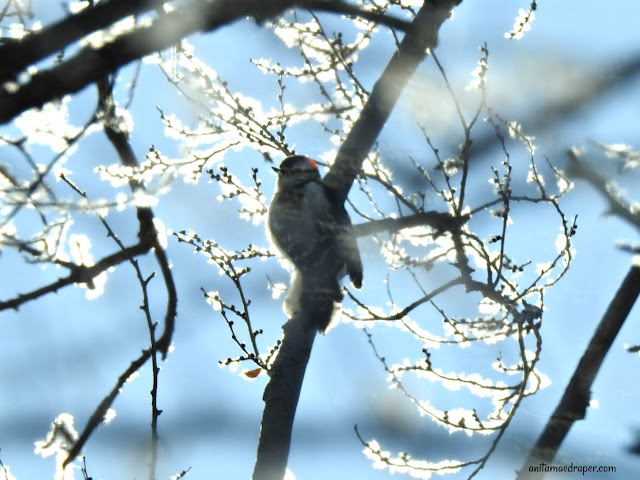 A few days later, I caught this Downy Woodpecker male perched among the frost-covered axils, or flower buds, of our Siberian Elms. When I look at this image, I think of apple blossoms instead of frost though. If you're ever driving down a prairie road, I'm sure you've seen those small birds that seem to wait until you get to them before flying out of the way. In the winter around here they're usually Snow Buntings, with Horned Larks coming in the spring. This year the Horned Larks didn't migrate, so we had flocks of both. Although similar in size and shape, the colouring is very different . For example, the Horned Lark has a distinctive yellow throat that I like to compare to an egg yolk or tennis ball when describing it. 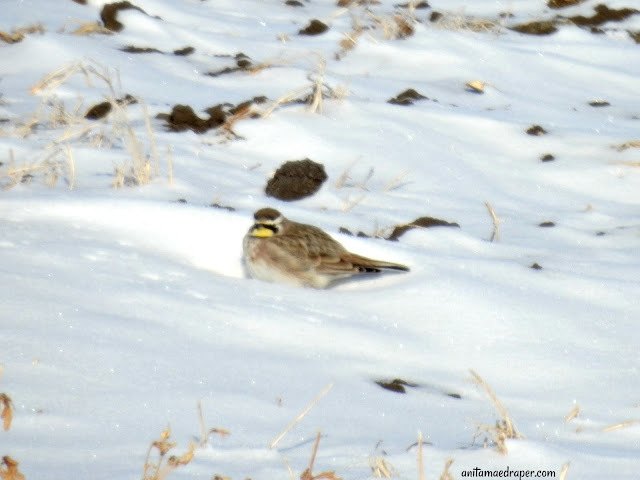 I was quite surprised to find a Horned Lark in one of the images of Sharpies I was checking for this post. 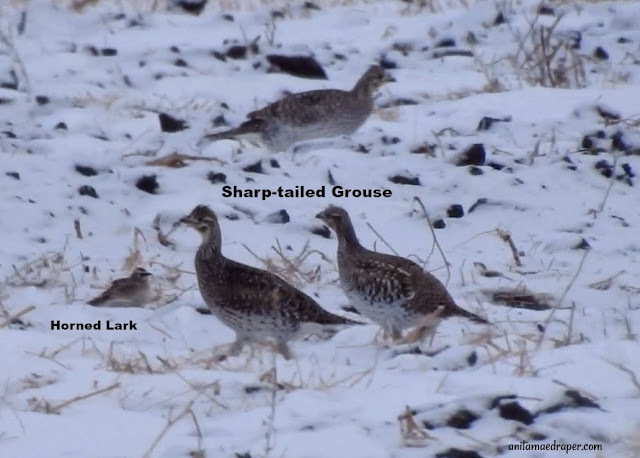 Although you can't see the yellow throat much due to the low-light level on that day, the image gives a good indication of the size difference between the Horned Lark and the Sharp-tailed Grouse. 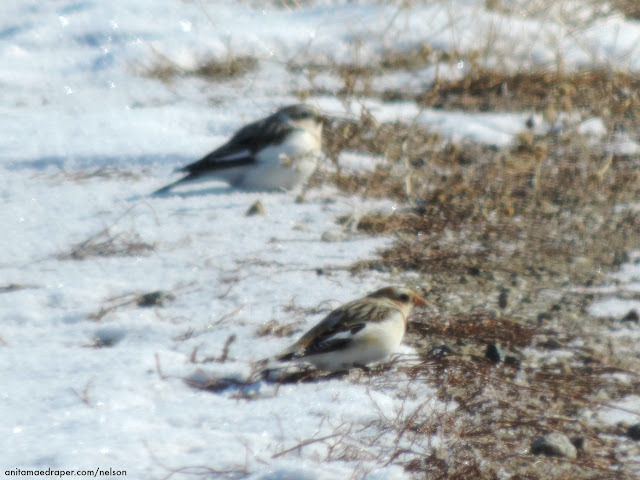 Those other birds you often find on the prairie roads are Snow Buntings. I was pleased when Nelson managed to take a photo of a couple of them because it's not often we see them sitting still. I believe the photo was taken either through his windshield, or reflected through his side-view mirror. Our resident sparrows hang around the Cotoneaster bush close to the mixed bird feeder when they're not sleeping in the barn loft. They like the cotoneaster because it offers protection in case a hawk or such comes marauding. If I find the sparrows scattered around the yard like sentinels, I know they're staking out their territory, so I grab my camera and check for visiting birds. But if the sparrows are clustered together in the poplar or apple trees, I know that danger lurks. 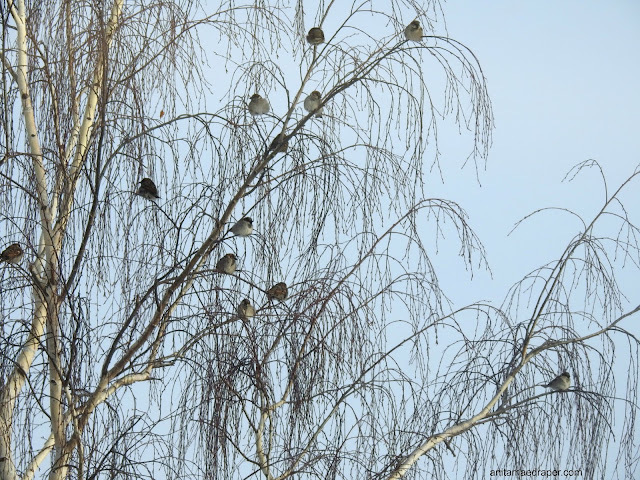 This was the case when I saw the House Sparrows perched in the Weeping Birch. I grabbed my camera and scooted outside, but only caught the barest glance at a small hawk before it passed over our large spruce trees. A few minutes later, the sparrows were back at the feeder and all was calm once again. I've often read and heard that suet feeders help the birds get through the winter because of they gain energy from the suet. This was our first year for this suet feeder which we hung outside my office winder. I must say I was quite disappointed when our resident chickadee only sought out its treasures once in awhile, and the redpolls ignored it completely. Some days the redpolls would eat the swelling axils of the Siberian Elms, acting like binge eaters who wouldn't get another meal for weeks. That all changed on Feb 21 with warming temps when the redpolls discovered the suet feeder. 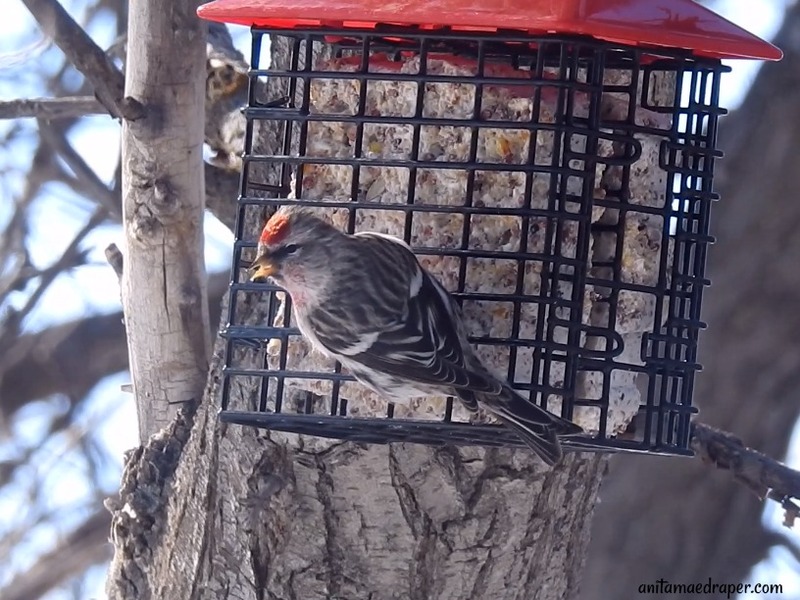 It seems our birds prefer to peck at the softened suet instead of chipping away at it. As for our resident Black-capped Chicadees, they hold their own where the suet feeder is concerned, after all, they found it first. They also make regular trips to the Niger, or Nyjer, seed feeder and then hide the seed under bark and in tree crevices for cold weather days. 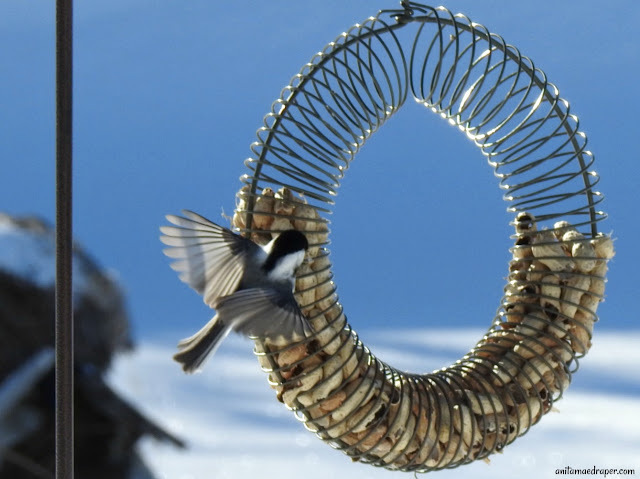 The chickadees also chip away at the peanut wreath, the only bird we've seen use it. So far no blue jays have found our peanut offering, but we'll keep watching for them. 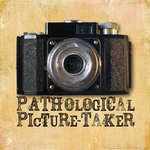 Wife of 1, Mother of 4, Author of Romance, Photographer of Nature, Blogger of God's blessings no matter what form they appear.